PROSPECT HEIGHTS – Voting kicked off this past Saturday and you have all week (until April 15) to vote for the projects you want to see completed as part of the Participatory Budgeting (PB) process. PB is a democratic process where several council members — this year in Brooklyn it’s Levin, Reynoso, Cumbo, Cornegy, Menchaca, Lander, Eugene, Williams, Treyger, and Yeger — allocate at least $1 million from their budgets to give residents in their districts a direct say what the money is spent on. You can vote at any Link kiosk, at a voting site, or online. Voting at Link kiosks is new this year, and is a collaboration among LinkNYC, NYC Council, and the NYC Department of Information Technology and Telecommunications (NYC DoITT). 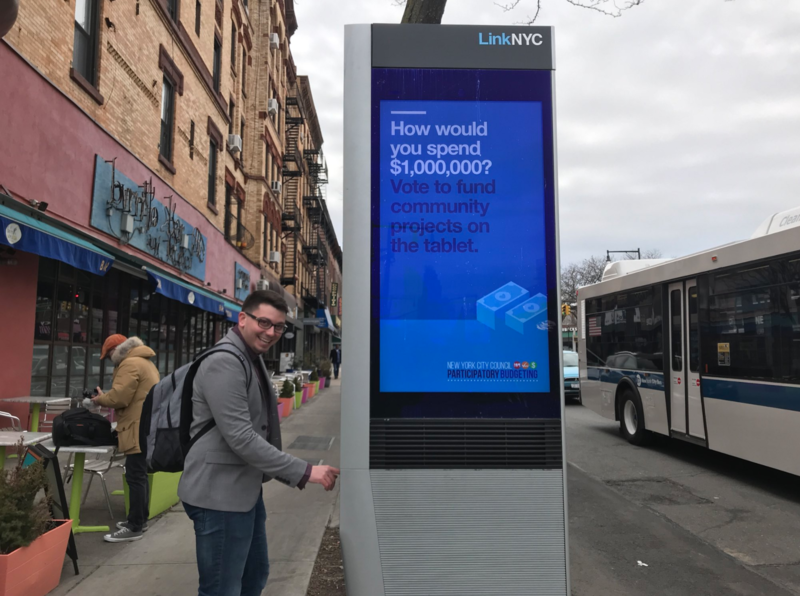 “We always envisioned Link as a platform for civic engagement and are thrilled to support the City Council’s Participatory Budgeting efforts this year, providing another way for New Yorkers to vote for projects that will directly improve their quality of life,” said Jen Hensley, president of LinkNYC said.
.@PB_NYC voting is going strong! We kicked it off in @bradlander's district over the weekend. Through Sunday, you can vote to determine how $1 million is spent in your community. At the kick-off, NYC DoITT Commissioner Samir Saini was also there encouraging people to take advantage of Link kiosks across the city. “We’re honored to work with the Council to put democracy at New Yorkers’ fingertips. This year, more than 1,500 Link kiosks present that many more opportunities for residents to vote for the neighborhood projects that matter the most to them. I look forward to introducing New Yorkers to even more ways the Link platform can be used to foster civic innovation within our great city,” Commissioner Saini said. You can vote at any Link kiosk, at a voting site, or online.